Okay,before reading this post of mine,let me warn you in advance that these are very hearty but turned out to be amateurish attempt by an amateurish baker.I am no patch to the ones made by Aparna here. From the moment she posted the banoffee cupcakes,I wanted to make some.Then finally I made the cupcakes which turned out fine,but my condensed milk toffee sauce goofed up. But I remade it again though I am not sure it could be called a 'sauce' .But anyway heres my version which is as hearty as the original. Sift together flour,salt and baking powder in a bowl.In another big bowl,beat together butter and sugar until smooth.Beat in egg /egg replacer until well incorporated. Here I used flax seeds as a replacer.You can use any other as well.Flax leaves grains in the finished product but since we are using mashed banana which also leaves its fibres in the product,I thought flax also fits here.Feel free to use your choice.Also I was short of 1 tbsp of butter,so I beat in 1-2 tbsp of banana before folding the rest of banana and flour mix. Fold in mashed banana and sifted dry mix and beat in until well mixed .Here since my batter was a bit thick,I added 1-2 tbsp of water to get the cake batter consistency. Bake at 180C for about 15-20 minutes or until the tester comes out clean.Mine took exactly 15 minutes. Let it cool completely while you prepare the toffee sauce. Here I had to make the sauce twice.First time ,it was so hard that it was like toffee and not toffee sauce.Second time around I lightly boiled it and stopped when it was still liquid.Melt butter in a thick bottomed pan and add in condensed milk and pinch salt.I used salted butter and so avoided salt.Boil till it turns light brown.Keep aside. 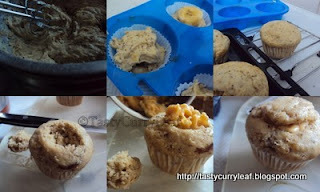 As suggested by Aparna,I used the cone method to insert the sauce into the cupcakes.You can see the pictorial for this at BakingBites but my simple attempt is also here. Frost it with whipped cream and sprinkles/chocolate curls or vermicelli.Perfect cupcakes with a toffee sauce. Simple but droolworth dish which also goes to Valli's Tried & Tasted - an event by Lakshmi- where MyDiverseKitchen is in the spotlight. Moist and delicious cupcakes !!! Love it !! omg this looks so good,.. Cute looking and very tempting cupcakes..
Am so happy you chose these cupcakes and liked them too. My husband just loves these. Those cupcakes look really so pretty ..thanks for sending it..